Most weeks we have eggs for dinner one night, normally a Tuesday because that's Slimming World night so I need something quick and easy. 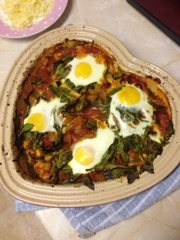 I like to try out different recipes and this is a lovely winter warmer. 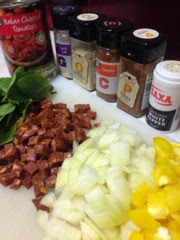 Fry the onions and chorizo (cubed) and add pepper to soften slightly. Add the tomato purée and spices and fry for few seconds. 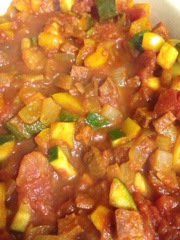 Add the tomatoes and let it simmer gently and reduce down. Add spinach and leave to wilt. Once it's fairly thick, add the eggs and put in the oven to bake. I go and check every now and again to get them the best consistency. 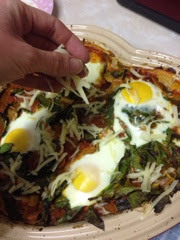 Once you are happy the eggs are cooked, remove from oven, sprinkle with cheese and serve. You can also use beans into this to make it extra hearty and serve with crusty bread but we went wedges so left out the beans. This would make great the evening after the night before meal when you need something filling but quick (and not many pans used in the making of it).